Guy the Beagle Rode in Queen Elizabeth's Car for the Royal Wedding- Truth or Fiction? Guy the Beagle Rode in Queen Elizabeth’s Car for the Royal Wedding-Mostly Truth! Meghan Markle’s rescue dog, Guy the beagle, rode in a car with Queen Elizabeth during Royal Wedding festivities just years after he was nearly put down at a shelter. 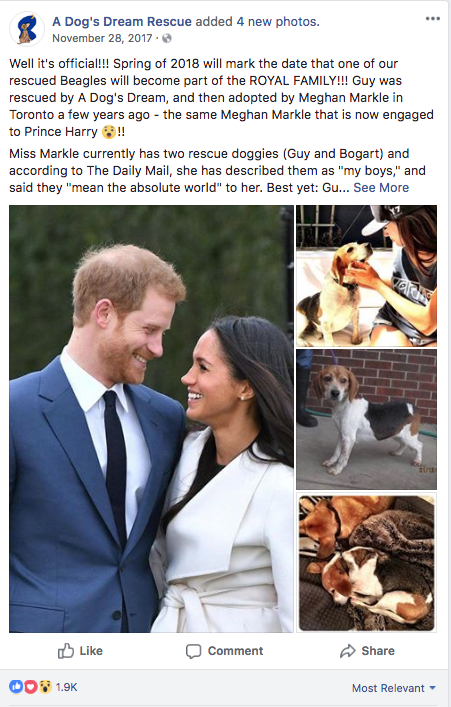 Guy the beagle became an international sensation in the days following the Royal Wedding. Meghan Markle adopted the dog just days before he was scheduled to be put down at a shelter in Ontario. And, three short years later, a picture of Guy riding in a car with Queen Elizabeth made for a modern “rags to riches” fairytale. Guy the beagle was photographed riding in a car with Queen Elizabeth the day before the Royal Wedding. Guy the beagle was rescued from the woods of Kentucky and has since bonded with Queen Elizabeth. Queen Elizabeth has long been known as a dog lover. She was regularly photographed with her dogs, Pembroke Welsh corgis. And her last corgi reportedly died in the weeks leading up to the wedding, setting the stage for her improbable friendship with Guy the beagle. Celebrity gossip site Lainey Gossip was the first to catch that Guy the beagle was riding in a car with Queen Elizabeth the day before the Royal Wedding.